Mannequin of a Tautavel Man—would he have had known how to make fire? Photo credit by Eric Cabanis/AFP/Getty Images. A brief primer on these species: H. erectus originated about 1.8 million years ago. These hominids were about as tall as modern humans, but probably hairier and definitely dumber. It’s thought that both Neanderthals and Homo sapiens evolved from H. erectus, with Neanderthals emerging about 600,000 years ago (and going extinct around 30,000 years ago) and modern humans emerging around 200,000 years ago (and still going strong). Neanderthals were shorter and had more complex societies than H. erectus, and they’re thought to have been at least as large-brained as modern humans, but their facial features protruded a little more and their bodies were stouter than ours. It’s thought that Neanderthals died out from competing, fighting, or interbreeding with H. sapiens. According to Wrangham, H. erectus must have had fire—just look at their anatomy! H. erectus had smaller jaws and teeth (and smaller faces in general), shorter intestinal tracts, and larger brains than even earlier hominids, such as Australopithecus afarensis, for instance, who were boxier, more apelike, and probably duller. Wrangham argues that H. erectus would not have developed its distinctive traits if the species hadn’t been regularly eating softer, cooked food. Wrangham’s theory is elegant, but the archaeological record is a little more complicated. There is definitely evidence of fire around 1.6 million years ago in what is now Kenya. But archaeologists dispute whether this was manmade or natural fire. Further complicating Wrangham’s hypothesis is evidence that hominids may not have brought fire with them when H. erectus moved out of Africa into Europe around a million years ago. If fire was as transformative and beneficial as Wrangham said it was, you’d think our ancestors would have brought it with them when they moved to colder climes—or died out if they were unable to do so. If H. erectus didn’t bring fire mastery to Europe, who did? Archaeologists Wil Roebroeks of Leiden University in the Netherlands and Paola Villa of the University of Colorado Museum found evidence for frequent use of fire by European Neanderthals between 400,000 and 300,000 years ago. Roebroeks and Villa looked at all the data collected at European sites once inhabited by hominids and found no evidence of fire before about 400,000 years ago—but plenty after that threshold. Evidence from Israeli sites put fire mastery at about the same time. H. sapiens arrived on the scene in the Middle East and Europe 100,000 years ago, but our species didn’t have a discernible impact on the charcoal record. 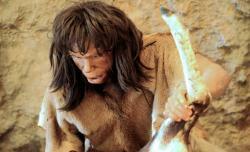 Roebroeks and Villa conclude that Neanderthals must have been the ones who mastered fire. Why on earth can’t scientists agree on whether people mastered fire 1.8 million years ago or 12,000 years ago? That’s a 150-fold difference. Well, figuring out who burned what, when, is not an easy business. For one thing, archaeologists can’t always tell what caused a fire: a volcano, for instance, a lightning strike, or hominid ingenuity. And even if there is clear evidence of hominid fire use—a hearth at a formerly inhabited cave, for instance—it’s almost impossible to tell whether it was created by people from scratch or merely stolen from a natural fire and then transported to a hearth, where it was kept alive as long as possible. Scientists call this kind of fire use opportunistic. What’s more, even when people were creating fires, the evidence of said fires doesn’t always stay put. Ashes have a tendency to blow away instead of embedding themselves neatly in the archaeological record, while water can take evidence of fire from its original location and carry it someplace completely different. Then there’s human error: As Sandgathe et al. write in their discussion of the available evidence, “There are … examples where residues originally interpreted as the remains of fires are later identified as something else.” (I hate it when that happens.) At one site in China, for instance, layers of earth originally believed to be ashes were later revealed to be silt and unburned bits of organic matter. Archaeological methods are improving, and they may well end up bearing out Wrangham’s hypothesis. In a paper published earlier this year, archaeologists used advanced techniques (known as micromorphological and Fourier-transform infrared microspectroscopy) to examine sediment and reveal evidence of fire at a million-year-old South African cave site. “Sure, that would be pretty compelling evidence,” admits Sandgathe. But he’s hopeful that genetics will bolster his hypothesis: that Neanderthals survived frigid glacial periods not because they regularly used fire, but because they had thick body hair. “At some point someone may announce the discovery of the gene or genes that code for thickness of body hair, and so could answer that question,” he says. Judging from the way things are going, this debate may rage on for a good while longer. And there is room for more than one right answer: It’s possible that different groups mastered fire independently of one another at different points in time. But laypeople can take comfort in knowing that, even if we don’t know yet who first mastered fire—our simple ancestors almost 2 million years ago, our more advanced cousins 400,000 years ago, or our direct antecedents about 10,000 years ago—there’s no doubt who holds the intellectual property rights to it today. We even put it in an oven and made it our own.